Newcastle boss Joe Kinnear is to wait until end of the season before signing a new contract with the club. The 62-year-old's current deal runs until the end of the season but he says there is a two-year extension on offer. "My contract situation is exactly as it was," said Kinnear. "It is sitting in my drawer in my desk, and I will address that at the end of the season. "We came to the conclusion the best decision to make was to get around the table again at the end of the season." Kinnear's spell at Newcastle has not been without controversy since he took over from Kevin Keegan in September last year. In October he launched a furious attack on the media in a news conference, swearing 52 times. And in November Kinnear was charged with improper conduct after his criticism of referee Martin Atkinson following his side's defeat by Fulham. Last month he was handed a a second misconduct charge by the Football Association after a bust up with Hull boss Phil Brown during Newcastle's 1-0 FA Cup defeat. 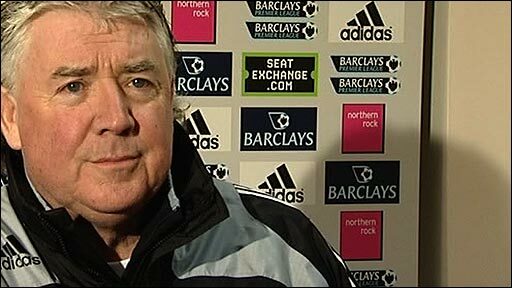 Kinnear was recently criticised by Professional Footballers' Association chief executive Gordon Taylor after the Newcastle manager mispronounced former Magpies midfielder Charles N'Zogbia's name in an interview, calling him "Insomnia". N'Zogbia then moved to Wigan after he refused to play for Newcastle again under Kinnear. Taylor described Kinnear's comments as "disrespectful and at worst deeply offensive". Newcastle are currently one point above the relegation zone.